As you may remember from my last post, I still had some of those little baby carrots left over from the art opening after I made the Apple Carrot Amaranth Bake–about 3/4 of a pound, to be exact. 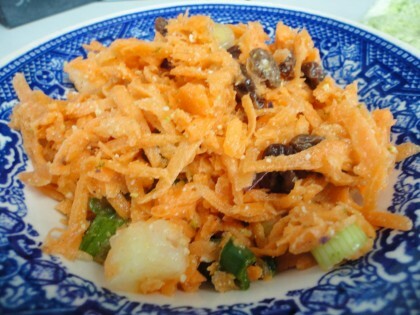 I had recently revisited Susan’s lovely recipe for Carrot Cashew Salad, and the detail of putting the cut lengths of carrots horizontally into the food processor for shredding had stuck with me. I realized that these baby carrots were already a size that would fit perfectly if I were to try and stack them horizontally into the feed tube. Before I go any further with this, I want to say that this “vegan version” is a blatant case of me fiddling with a perfectly good recipe. So if you have picky eaters at your house, or you’re not as cashew-shy as I am because of their high saturated fat content, then by all means click on over to Susan’s Cashew Carrot Salad, which is the true original, and make that one. You’ll get a creamy tasty slaw that won’t disappoint. But if you want to follow me into fiddling territory, I’ll share with you a slightly lower fat version that uses just a tablespoon of cashews (which is what I found on my shelf) and another 2 tablespoons of unsalted pistachio nuts (which I also found on my shelf). I also wanted to fiddle with adding some “grown-up” seasonings, and a couple of other surprises too. These things may not be picky kid friendly, but they make for a delicious combination of (again) somewhat unusual tastes. And all with things I had on hand. Follow Susan’s wonderful directions here for plumping the raisins and shredding the carrots in the food processor. She suggests adding all the ingredients for the dressing to the blender and blending, but being the lazy cook I am that hates to deal with these appliances, I just whirred up the dressing in the food processor since I already had it out, and it worked fine for me. Chop up the pineapple and the green onion and add them to the carrots in a medium sized bowl. 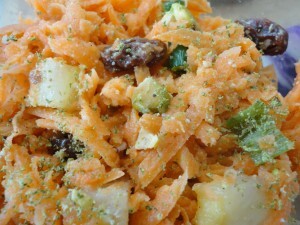 Drain the raisins and add them to the carrots, along with the chopped pistachio nuts. Mix in the dressing. Then sprinkle generously with the ground spices and combine, to taste. If it seems to need a bit more moisture, you can add more lime juice, but only a little. Finally, sprinkle it all with the lime zest. This salad just gets better and better the longer it sits and the spices and the sweetness of the pineapple settle in, so if you have time, chill it for a while before eating it. And look forward to delicious leftovers the next day. You might be wondering why in the world I have such an exotic ingredient as fresh pineapple chunks “on hand.” As I mention in my post Power to the Pineapple, fresh pineapple is chock full of anti-inflammatory micronutrients. I feel their benefit instantly. And it’s not that labor intensive to eat a little pineapple every day either. Or expensive. Here’s what I do. I buy a half of an organic pineapple. (The Co-op regularly offers this, and if one isn’t cut in half, they’ll do it for me.) Each morning I put it face down and slice a slice or two off. I trim it and chop it up to put in my breakfast or my lunch bowl. It keeps really well with the rind still on until I’m ready to slice another slice off, and I get a little shot of pineapple medicine every day for about a week. And for only about $1.99 a pound, far far away from where organic pineapples grow. I thank everyone who grew them with every luscious bite. They add sunshine to my winter meals, which is why I call this Sunshine Carrot Salad. If you don’t like pineapple for some unfathomable reason, but you like mangoes, and they are affordable where you are, I think a little mango in this salad would bring its own kind of wonderful sunshine to your taste buds. I ate the last bit of this salad as the top layer in a bowl of kale massaged with a bit of mashed sweet potato, carob powder and pear-cinnamon infused vinegar, some leftover black beans, and warm amaranth. To my eclectic taste buds, it was ambrosial. Now that those little carrots are all gone, I might just have to make this again sometime with the big ones. Hi Lee–Thank you! I’m glad to hear you’re interested in a lower fat version. Also glad to hear keeping your fat intake down is helping with a health issue you’re working on. It’s been gold for me to do that. I’m thinking of fiddling with this even further and perhaps trying a dressing using Susan’s strategy in her latest salad dressing recipe, only adding some mango to puree. So something like almond milk mango and some golden flax. Then just putting a tbs of pistachios into the actual salad. It’s fun to fiddle and come up with something tasty and lower in fat! Thank you for posting this. I just made it and YUM!! !